The AudioCubes are a modular live performance instrument. The cubes let you make music and shape sound through novel hands-on interaction with wireless objects. AudioCubes offer new ways to interact with your existing audio software, beyond what is possible with classic knob boxes and trigger pads. There is no limit to the number of cubes you can use. Each cube can be assigned a behaviour and colour. 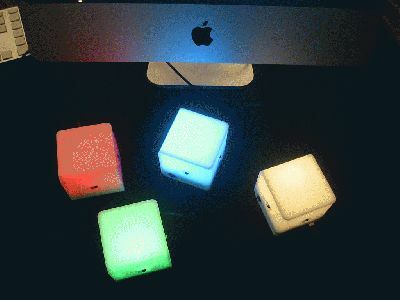 The AudioCubes are a very visual and immediate interface to work with music software on your computer. High-speed, high-resolution, better-than-MIDI sensor technology makes sure even the most subtle performance gestures are captured., says Bert Schiettecatte (30), designer and inventor of AudioCubes. Well known artists such as Pragha Khan, Richard Devine, Test Shot Starfish, ... are using the cubes. To bring a new concept or product to the market requires a lot of energy and dedication. In recognition of this audio innovation, Schiettecatte has been nominated for Qwartz award in Paris. To be nominated for the Qwartz Award is a great honour and confirmation that the cubes are truly regarded as a revolutionary innovation by the electronic music community.